There’s a national vacation for every date on the calendar and for every topic under the sun, but National Pool Opening Day is a holiday that all pool owners can get behind! As a pool owner, you know there is a lot of tasks that go into opening your swimming pool. National Pool Opening Day is a great yearly reminder to upkeep the many components of your swimming pool to prepare for a fun and safe pool season. You’ll want to test your water before you do anything else. You’ll need to test your pool chemical levels to see what to do before you start swimming. There are a couple of ways to go about testing your pool water. You can buy a testing kit and do it yourself, or you can buy something like the pHin, that will test your water for you and tell you exactly what your pool needs to become swim ready. When you’re buying shock tablets, don’t forget to get the other chemicals you need to re-balance the pool. Algaecide and water clarifiers help control the algae levels of your pool and will help your pool filter remove fine dirt particles it may normally miss. Other chemicals you may need for your pool are sanitizer, water clarifier, waterline control, filter cleaner, or chlorine tablets. You should examine all your pool equipment, especially the pump and filter. You want to make sure they’re working correctly or if they need to be replaced. You’ll need to check your other pool equipment like pool valves, chlorinators, heaters, cleaners, skimmers, ladders, slides, and diving boards. It’s better to check these before pool season starts, to ensure they’re repaired or replaced before you want to swim. Your heater will require some basic care and spring cleaning when prepping your pool. You’ll need to wash out the foundation and remove any cobwebs, leaves, or other debris around or in the heater. Make sure that you look over the drain holes and air vents to ensure they’re not obstructed. It’s common for leaves to get inside your heater, but they can harm your heater if they’re inside while it’s running. Equipment reassembly for your inground pool can be a little complicated, so if you’re feeling intimidated be sure to call an expert. You’ll want to start by screwing the drain plugs back into your pump, filter, and heater with Teflon tape. When your water level raises to the appropriate height, you can remove your winter plugs from the skimmer and wall returns. This will help flood the lines. Next, you’ll want to fill the pump with water from a hose and seal the lid tightly. Then you will open the filter, open the suction valves, and turn on your pump. This is the best and easiest way to flush out the skimmer and drain of your pool. Now you’re going to fill the pool with water to the middle of the skimmer and open the air filter. Then you can open the valves to flood the lines and fill the pump with water. Plug the pump into a grounded electrical outlet, open the suction and return valves, and remove any plugs in the pool skimmer and wall return. If you notice any leaks during this phase, you’ll want to shut off the pump and either try to fix the issue or plan for a replacement. National Pool Opening Day is the last day of April every year! The best way to join in the festivities is to open your pool! If it’s still too early to open your pool you can join the party by getting out there, cleaning off the cover, and clean the surrounding equipment. If you need help opening your swimming pool, contact us now! Have you considered getting an outdoor kitchen for your home? Outdoor kitchens can be a great addition to the right home. We’re going to discuss all of the benefits that come with installing a kitchen in your backyard or patio arrangement. Outdoor kitchens are generally thought to be a luxury item, that can make your house more marketable. Outdoor kitchens have a higher rate of return on your investment, like constructing a garage door in comparison. In case you don’t have a huge yard, make sure you take into account the dimensions of your kitchen. Prospective home buyers enjoy having an open area which isn’t consumed by structures, like pools and kitchens. Whenever your outdoor patios are coupled with an outside kitchen, food prep becomes sort of a group activity. Therefore, no one gets stuck inside cooking while everyone else is drinking on the patio. Another benefit of having an outdoor kitchen is you can keep the smells of grilling or charring foods outside. You won’t have to deal with the smokiness or worry about your house smelling like whatever you’re cooking in the summertime. An outside kitchen retains cooking grease, odors, smoke, and heat outside–a big plus in sweltering summertime. Cooking outside can also help you save money and energy on your bills. When you cook outside, your A.C. won’t have to work overtime to deal with the heat in your kitchen. When designing your outdoor kitchen, you’ll want to put a lot of time and thought into what exactly you want and need. A great first place to start is thinking about the ventilation. You’ll want to create a way for smoke to rise and dissipate from the area. Another priority you should think about first is the size of your patio and the measurements of the accessories. You’ll want to make sure you have enough space for the items, and for anyone on the patio to fully relax. First, you’ll have to think about the size of the grill you want. This solely depends on how many people you want to cook for, what you’re going to cook, and how often you’re going to use the grill. If you plan on hosting large parties and cooking for every guest, a bigger grill is more your style. Though if you just want to cook for your family, and medium to a smaller size will be fine. You can also decide if you would like your grill to be connected to the ground, or if you would like to be able to freely move it around. This will also be dependent on the size of the grill you need. When thinking about countertops, you need to think: “How much prep space do I need?” If you plan on preparing a lot of recipes outside, you’ll want a lot of space. If you’re unsure, get a countertop that’s easy to change out or add to. Cabinets are a great convenience to have outside. With this addition, you won’t have to run in and out from your house to retrieve extra silverware or plating. You can also invest in cabinets that you can lock if you’re worried about theft. Lighting is what separates the good, bad, and ugly outdoor kitchens. Proper lighting will ensure that you can use your outdoor kitchen at any time you want. Floor lighting, fairy lights, LED, and lamps are all great options. Lighting can add ambiance and will ensure your guests will be able to see all the delicious food you cook them. Having an outdoor sink can be really convenient for you and your guests. You can wash and rinse any outdoor plates right outside, or allow your guest easy access to water refills. The only limitation you have to a sink is making sure you’re able to connect it to your water source. Outdoor refrigerators are a great item to have that will completely separate your outdoor and indoor kitchens. You can store the ingredients you want to use outside there, and you can reduce the number of times you have to run back inside. You can go with mini or full-size options, it all depends on your needs and wants. Your best option for flooring is to go with a material that will be able to stand the elements of being outdoors. Concrete, brick natural stone, and tile are great options that can look good and last. If you have any questions about how to create your own outdoor kitchen, don’t hesitate to contact us here. There is a national holiday for each date on the calendar and also for every subject under the sun, but National Pool Opening Day is a holiday we can all rally round. 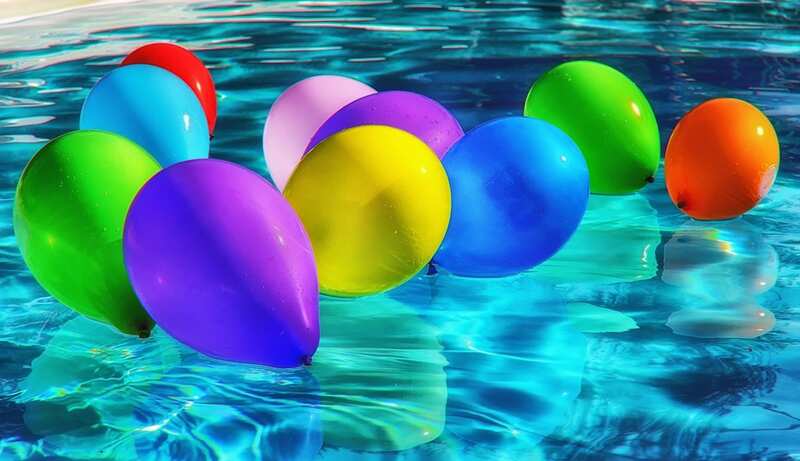 As a pool owner, you understand there’s a lot of things that go into opening your pool, and National Pool Opening Day is an amazing reminder to check and maintain the many moving parts of your pool, to prepare for a happy, secure season of a swimming pool. Once you peel the winter cap and realize the challenge before you, begin by assessing your pool chemical levels. A good water test kit is important for testing your pool’s chemical balance. When stocking up for summertime on pool shock and pills, don’t forget to purchase water balance chemicals for pH, alk, and calcium. You might also need an algaecide and water clarifier to control algae and assist your filter removes finer particles out of the water. Examine the pool gear, mainly the filter and pump, but also other pool equipment like pool valves, chlorinators, heaters, cleaners, skimmers, ladders, slides and diving boards. Start looking for any soil, mulch, trees or nearby plants that may get in the way of your equipment. Pool equipment does better in a sunny, dry location and not buried in bushes. Pool cleaners have wearable components, and generally, require more frequent repairs than other pool equipment. Inspect closely for the cleaner parts that contact the surface, or debris totes or hose components that are worn. Pool filters, either sand, DE or cartridge will need the filter press replaced at a single point. Sand lasts about 5 decades, DE grids for ten decades, and filter capsules 2-3 years for a good sized filter. You can prolong the life and improve filtration by using a Pool Filter Cleaner before and after opening your pool. Pool pumps have electric motors that will fail at some point in time, usually at spring startup, or at the hottest aspect of the summer. When your motor will not turn or trips the breaker, it might be a loose cable, triggered GFCI or it might be an engine that is fried. Pumping problems may be air leaking to the pump, or a clogged impeller, or the water level. Pool Ladders, Slides & Diving Boards possess a lot of bolts that need to be checked for tightness. Notably the step treads, which can loosen over time. Chlorinators are normally easy to care for, but the chlorinator lid o-ring needs to be lubed often to protect the o-ring from the chlorine. If you have a pool heater, the best spring maintenance you can do is clean out the base of the device to remove any leaves, cobwebs, and ant hills. Make sure the air vents and drain holes aren’t blocked in the cabinet. If leaves have collected inside a heat pump, or in addition to a gasoline heater exchanger, remove the heater top to wash out them. Above ground, pools will join the hoses or pipes from the wall skimmer to the pool filter and then to the pool pump, and back to the pool return. Open the filter air bleeder, open the lines to be flooded by the valves and fill the pump with water. After being sure that the return and suction valves are available plugs the pump into a grounded electrical socket, and the pool skimmer and wall return aren’t plugged. Inground pools equipment reassembly is a bit more complicated, but it begins the exact same way, by screwing the drain wires back to the pump, heater, filter. Together with the water level up, pool plugs can be pulled out of the skimmer and wall contributes to flooding the lines. Contrary to Above ground pools, inground pumps sit above the water level. Fill the pump with water from a hose or hose, and seal. Open the filter air bleeder, open the return and suction valves, and then turn on the pump. Start-Up with a multiport valve on the ‘Waste’ place is a fantastic way to flush out the skimmer and drain, and it has much less resistance too, great for pumps that have difficulty ‘grabbing prime’. National Pool Opening Day is the last Saturday in April. Make it your annual tradition to join us in welcoming spring by opening your pool! In case the final Saturday is too soon to start your pool, then join in by cleaning off your pool cover and prepping it to open when it’s warm enough. If you open the pool in May, it is the ideal time to pull the cover, examine the water, and then add another quart of algaecide or shock the pool. If you need help opening your pool, contact us today! Spring has arrived and it’s time to bring the indoors out with cozy features. Your backyard is a continuation of your home which showcases your style and personality. Extend your time in the fresh air with outdoor seating areas that feel as cozy as your couch. 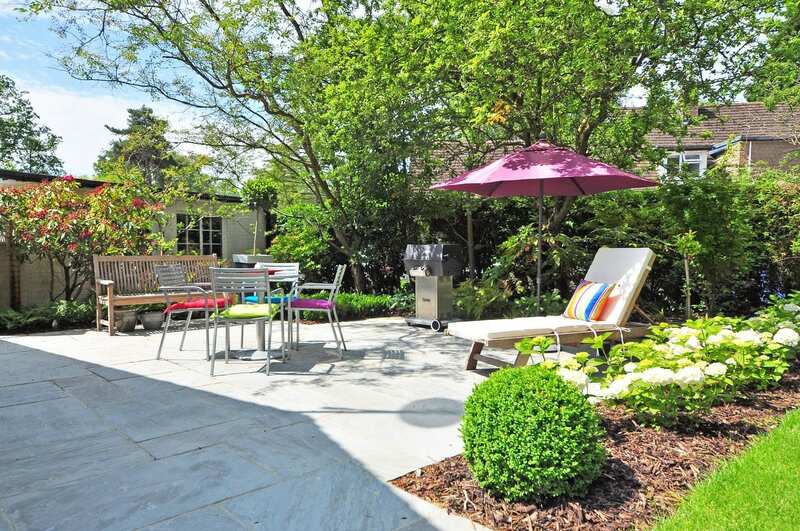 Here are some of our favorite tips to freshen up your backyard in time for spring. Deciding what spaces you need—dining area, cooking area, shady lounging area, play area—and clearly defining them can make a big visual impact on a yard. Your design is reliant on the space of your backyard, But you don’t need a large backyard to have a great outdoor space. Even in the smallest backyard, you can update your space in a fresh and easy way. Doing this can be as inexpensive as repositioning the furniture you already have. Or reupholstering new fabric on your outdoor lounge and chairs. A living room forms a gathering place in your home, so why not have the same outdoors? Outdoor loveseats, chairs, and a coffee table are simple elements that are generally inexpensive. Whether they’re looking for a place to eat or a comfortable spot to unwind, a mix of seating options will keep everyone happy. When you have a variety of comfortable seating choices, it adds flexibility and openness to your space. A pergola acts as a roof to create a defined space, just as your walls do indoors. With the addition of brick flooring, comfy furniture, and a warm fireplace, you’ll feel right at home. Effortlessly blend your indoor and outdoor space with an open-air living room. Comfortable seating, an outdoor bar, and floor-length curtains will make space feel like an extension of your home. Your backyard is a continuation of your home, so your outdoor design should be too. A coordinating color palette allows your design to flow both indoors and out with accent colors making each space unique. Create a welcoming outdoor retreat by incorporating accent pillows to your backyard design. Mix and match patterns and colors to perk up your outdoor furniture. Don’t be afraid to go bold, pillows are easy to change. With beautiful views and a custom outdoor space, your deck is the perfect place to enjoy the spring air. Add a free-standing hot tub to stay warm on those chilly nights or enjoy time with family and friends. Or get a grill so you can enjoy some sizzling food in the spring sun. A fire pit surrounded by comfortable seating creates a great spot to gather with friends and family. There are fire pit designs for every possible taste and preference – from bricks and concrete to metal. We all need a getaway from time to time. You can create a secluded area that feels warm and cozy in your own backyard. Natural landscaping creates the perfect backdrop for your backyard. You can add a few wicker chairs and a matching end table that mimic the surrounding landscape to enjoy your peaceful retreat for hours. Plants are a flexible, quick, and budget-friendly way to update your outdoor design each season. Adding vines to a pergola or fence softens the space while adding variety and interest. For a splash of color, consider potted plants that give you the flexibility to replace depending on the season or your color palette. A fenced-in backyard gives you privacy from street traffic and neighbors. Instead of a solid fence, choose a style that is more open. It will make your backyard seem larger. A lattice fence is perfect for small backyards. Pieces with thin frames and petite bodies make a small space feel roomier. Compact bistro sets are perfect for a garden corner or porch. Built-in benches will maximize seating and storage in minimal space. Lighting plays a major role in how space feels. So incorporate both task and ambient lighting to create the mood you want and to provide the amount of light you need. Now that your backyard is looking like it should, take the extra steps to turn it into a place you will want to spend time in. If you don’t have appropriate garden lighting, there is cheap solar lighting that is easy to install. A water feature adds good feng shui and if you don’t have appropriate garden furniture, there is attractive plastic garden furniture that is virtually maintenance free, resistant to the elements, and easy on the pocket. Also, comfy outdoor living requires shade, so make sure to include a sun umbrella, canopy, or pergola above any seating area. Have any questions about creating your perfect backyard? Contact the experts here. We’ve extended your chance to grab the best deals of the season at Cincinnati Pool & Patio! Find 75% off all patio furniture, all clearance items, and scratch-n-dent items April 2nd through April 8th! Comfort is important — very important. You may want steel or wood construction in your patio furniture for stability and longevity, but don’t forget that without some homey comforts like soft, plush cushions, your outdoor furniture will go largely unused. Avoid pancake cushions. You know, those thin, puny little cushions that aren’t plush or even very pliable. Opt for chubby cushions that feel light when you pick them up. Look for cushions with polyester filler, too. The more lightweight and springy the filler is, the more quickly it will dry out after exposure to moisture. That means it will resist mold and mildew and stay comfortable and sweet smelling longer. You can’t grab a pillow from your family room and expect it to adapt to life outside on the patio. Most textiles designed for indoor/outdoor use are made from all-weather materials that repel water or encourage moisture to evaporate quickly by remaining porous. Fabrics designed for use outdoors are usually fade resistant and UV protected, too. They’ll look good and feel soft and comfortable for at least a couple of seasons. When you’re evaluating fabrics for outdoor furniture, check cushion seams for heavy duty thread and consistent, even stitches. Choose cushions with vents that encourage airflow and quick drying. Invest in furniture with cushions that can be unzipped and taken apart for periodic airing, repair or replacement. It’s also a good idea to buy outdoor furniture outfitted with cushions you can turn and flip. This will help them retain their shape, dry more quickly and fade evenly. Acrylics, polyester, treated canvas and cotton duck are all comfortable, durable fabrics used in the construction of outdoor furnishings. Look for them in upholstered items, cushions, pillows, curtains, blinds and umbrellas. From sloppy welds to cracked casters to amateurish paint finishes, a close inspection will expose that great outdoor furniture bargain for what it really is — a bad buy that probably won’t last until next season. There are a couple of important lessons here: It’s easy to think of outdoor furnishings as somewhat less important than the stuff you buy for indoor use. In fact, the reverse is often true. What you buy to use outside has to stand up to sun exposure, wind, rain and probably some roughhousing, too. Inspect every piece you’re considering for flaws, especially if the deal sounds too good to be true. This is one area where a higher price is often a good indicator of better quality. 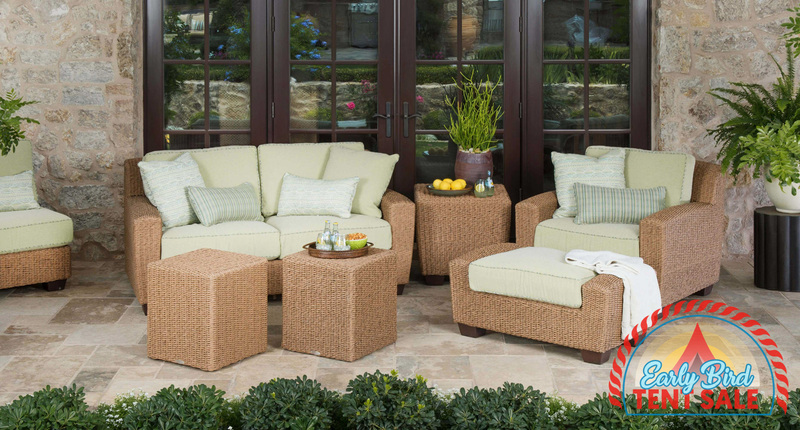 Check out our list of patio furniture here! If you have any questions about patio furniture or the sale, contact us here! During the spring and summer, we like to spend as much time as possible outside. But sometimes the nights and evenings can be too chilly to fully enjoy our backyard and outdoor living space. Fortunately for us, there are many options that can not only add warmth to those days that “look” warm and inviting, but can also provide hours of family activities and bonding. These options are outdoor fireplaces, fire pits, and patio heaters. Outdoor firepits and propane patio heaters range in style from a simple outdoor fireplace to those that add an elegant accent to an already classy backyard area. Whether you’re looking for a way to enhance your backyard with a cozy fire or to warm up your patio or deck, you can follow these tips on choosing the best outdoor heating solution for your family’s needs. There’s nothing like a fire pit to provide countless hours of outdoor fun, family time, and s’mores! Overall, pool and patio firepits are relatively simple – they allow you to enjoy an open fire in your outdoor living spaces. That being said, there are a few important things to know. The first thing to consider is what type of fuel you want to use in your fire pit – gas or wood. While wood is the preferred fuel because nothing compares to the smell and sound of a real campfire, some people may just want the heat without the fuss of starting and keeping a fire going. Second, you need to find the fire pit that best goes along with the rest of your backyard decor. Fire pits come in a variety of different sizes and shapes as well as materials used to build them. 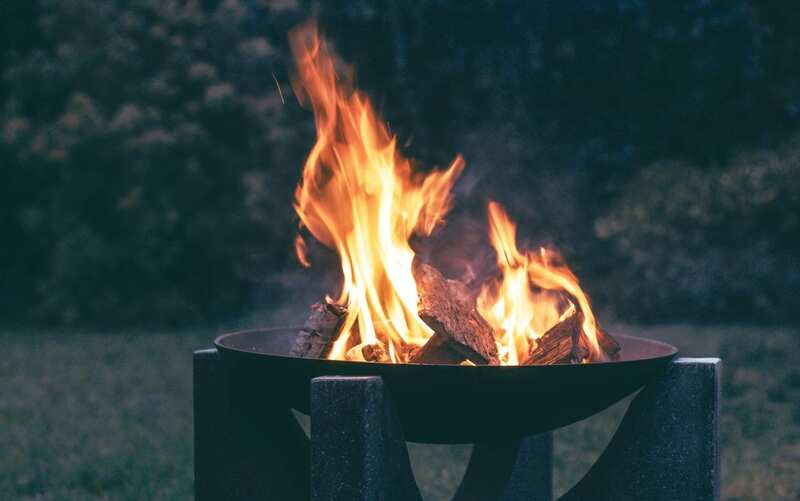 As a fire pit fanatic, I recommend looking for a bowl that is built from weather-resistant materials such as copper, stainless steel, or iron. While they may be a bit more expensive, you are getting your money’s worth. The better the fire bowl is built, the longer it will last, and look good too! Finally, make sure your fire pit has a sturdy cover. While it may seem silly to place a mesh fire screen in the pit while the fire is going, it very well may protect you and your home from jumping sparks as the fire crackles. Also available are off-season covers, to keep your grill clean and dry during times of non-use. This is a good time to explain the difference between a firepit and fire bowls. Firebowls are usually placed in the corners of pools, or next to a spa. More for accent, less for heat, fire bowls are usually a concave concrete design, filled with river rock. Equipped with a gas line and connected to propane or natural gas source, fire bowls produce a small, adjustable flame. Firepits are a larger affair, not quite a bonfire, but enough to produce some heat and a cooking source. There are many options to consider when shopping around for the perfect patio heater. To start, there are three different types of outdoor patio heaters: propane patio heaters, lamp-style heaters, and infrared heaters. Propane patio heaters are great for backyards and decks. Instead of having to worry about plugging them into an outlet, they are 100% self-sufficient. A propane tank is stored within the base and the heat is completely adjustable. These patio heaters are usually completely metal and are equipped with a safety shut-off – in case the heater ever gets tipped over. Instead of using propane, Lamp-Style Patio Heaters are powered by 1200 watt halogen light bulbs. All they require is a 120v grounded outlet! Like the propane heaters, they are also equipped with safety shut-offs. That being said, regardless of their height, they can both heat an area up to 12ft diameter – since they are powered by the same halogen bulbs. Lamp-style patio heaters usually consist of a resin body with a steel hood and feature weather-resistant hardware. These very stylish table heaters can add look and a feeling of warmth to your patio or deck. Infrared patio heaters use infrared waves to directly heat the object or person that they are pointed at. They cost substantially less to operate than propane patio heaters and have no warm-up time. Acting much like an outdoor lamp, they can either be plugged into a 120v grounded outlet. They come in two different varieties: wall-mounted heaters and umbrella-mounted heaters. They require no gas or open flames and since they are permanently installed, you don’t have to worry about storing them when they’re not in use. Have any questions about outdoor fireplaces? Contact us here!